How does parental role influence the activity and movements of breeding wolves? We studied the activity and movements of a male and a female wolf during breeding in the Bieszczady Mountains, Poland. The female was less active and mobile and on average closer to the den than the male. The male was less active and mobile when the pack size was seven compared to a year when the pack consisted only of the breeding pair. 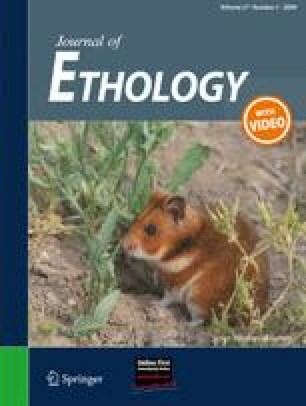 We conclude that the roles played by breeding males and females rearing pups influence their activity, and that breeding males in larger packs move less during the nursing period because of help by other pack members. This study was part of the Bieszczady Wolf Project and was funded by the Polish National Committee for Scientific Research (KBN 6P04F 006), and the Museum and Institute of Zoology of the Polish Academy of Sciences. Fellowships were provided by the Japan Student Services Organization (to HT), the German Donors’ Association for the Promotion of Sciences and Humanities (to JT), and the German Academic Exchange Service (to JE). We thank N. Maruyama and K. Perzanowski for their cooperation and L. Aubry, M. Barreteau, M. Carruthers, M. Diemert, S. Drevet, M. Januszczak, S. Kiener, K. Lahongre, M. Le Peutrec, K. Mayer, N. Schmidt, M-C. Schultz, M. Skuban and W. Schwimmer for their help during field work, as well as two anonymous reviewers for useful comments.